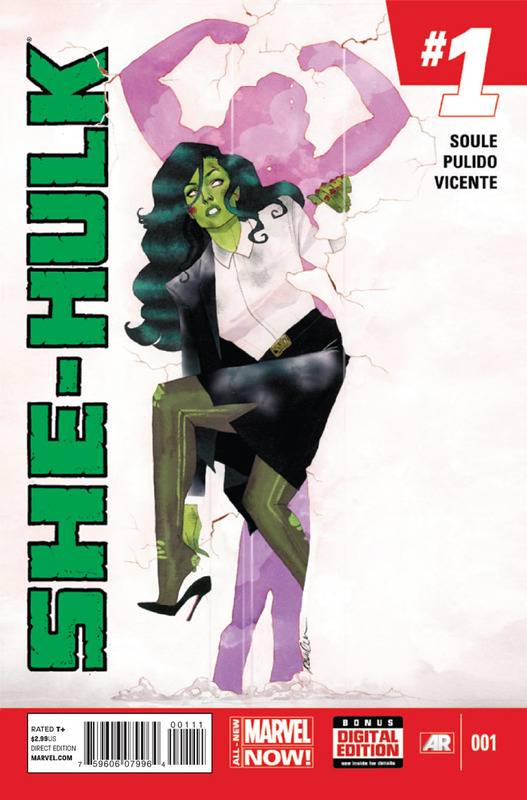 She-Hulk has two full time jobs: lawyer and superhero. But, as an attorney and comic book writer, so do you. 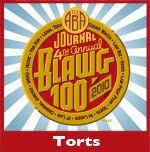 What are the challenges facing a practicing attorney who also writes comic books? How do you find the time to engage in both professions? It can be difficult, honestly. As I type this, I’m in my office thinking about various client issues I need to handle, as well as some writing work that will kick in the very moment I’m done. I can say that law school and subsequent legal practice (both at the firms I worked for initially and in my own solo practice) gave me a pretty solid set of time management skills. I’m used to handling pretty significant workloads and self-motivating. It’s certainly very, very intense right now, but as I’ve told folks who have asked me this question in the past (I get it a lot), I’m writing incredibly fun projects using some of my favorite characters, building an audience, and running my own successful business at the same time. There’s a lot of work, but I wouldn’t characterize it as a chore. How did you come to write comic books as a practicing lawyer? In a nutshell, I’ve always been creatively-oriented. I’ve been playing music since I was very young, and I worked regularly as a professional musician for years before and during law school. Some of that continued afterwards, but it became apparent that I might want to find another creative outlet that I could do more easily around the weird, unpredictable hours of being a young attorney. Writing seemed obvious, and I started my first novel during my post-bar vacation. Novels were/are fun, but also very time-consuming, and after a few years of working in that field, I tried my hand at comics, which I had always loved. Cut through about a decade of near-constant work, networking and good times, and here we are today. How do the deadlines in the comic book industry compare to those in the legal field, and how do you prefer to handle them simultaneously? Deadlines are deadlines. I think the most important thing about deadlines is just to know they exist. If I know they’re there, I can handle them – I can’t recall a situation where I couldn’t make things work if I had a little bit of time to adjust. There are a lot of deadlines these days, big and small, but I think it helps that it’s my own practice (so I’m the boss…) and that I’ve learned how to manage my time on the comics end really well. I wouldn’t mind fewer deadlines – who wouldn’t – but I’m on it. 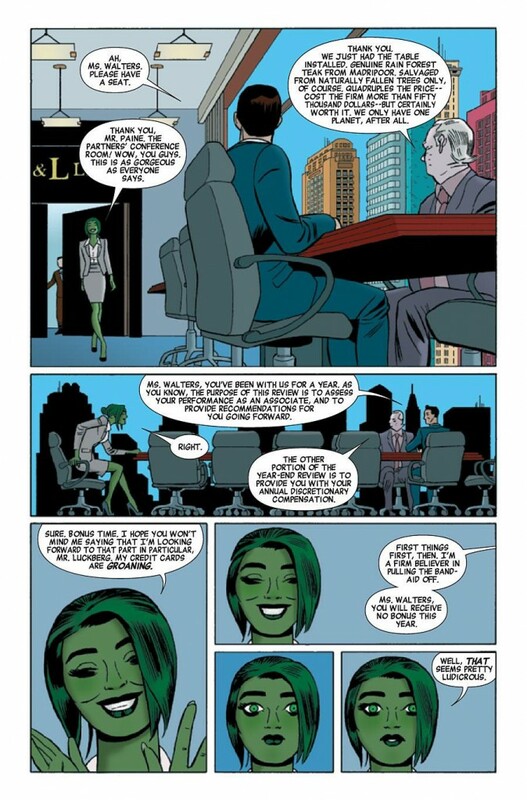 One of the most interesting sequences in She-Hulk #1 is the associate performance review when She-Hulk meets the partners at her firm. What was the inspiration for that part of the narrative? It’s taken very much in spirit from associate reviews either I had or friends of mine had. What you realize as a young associate at a big firm is that you’re courted to join, but once the honeymoon period is over (right around the time of those first reviews), it becomes clear that the goals of the partners do not necessarily align with those of the young associates. That’s totally fine, mind you – it’s a business – but it can be a bit of a rude awakening. What has been the reaction of your fellow lawyers to the legal scenes in your run on She-Hulk? So far, all good! 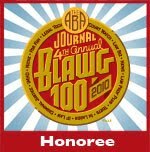 I was interviewed by the ABA Journal, which was a fun little professional milestone. I get the occasional quibble over details from lawyers, but it’s mostly pretty relaxed. Attorneys seem pretty pleased to see a lawyer represented even somewhat realistically in comics, even if I mess up the occasional practice point. Fortunately, I can always rely on one line: “The laws are different in the Marvel Universe.” Easy. 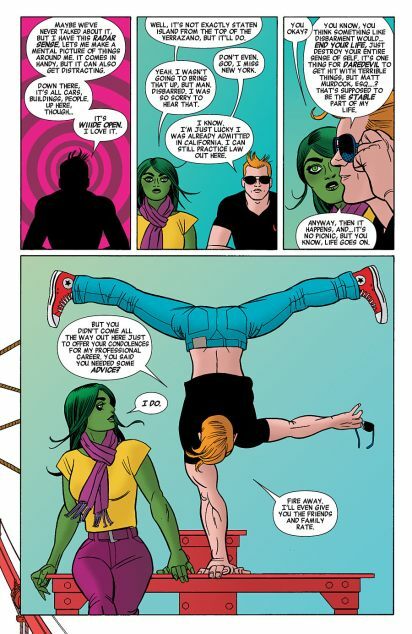 In issue 4, She-Hulk meets briefly with Marvel’s other famous lawyer super-hero, Daredevil, who remarks that it’s odd the two have never faced each other in court. First off, is that foreshadowing, and secondly, what specific challenges face those who write about lawyer superheroes as opposed to non-lawyer characters? Foreshadowing indeed. By this point, it’s out in the world that She-Hulk and Daredevil finally will face each other in the courtroom over issues 8-10 of the series. They’re working on a wrongful death lawsuit out in California. It’s been one of the most challenging things I’ve ever written – you can imagine that writing a case involving two brilliant lawyers, where both have to come off as brilliant lawyers, who can’t be shown in a non-heroic light . . . tricky. But fun! I’m very proud of that storyline. Throughout your run on the series, we’ve seen immigration hearings, injunctive relief proceedings, daily life at law firms, and even the face of pleadings, all of which are unique to the medium. How do you determine which legal issues appear in your work? It’s really about areas that I feel like I can write with some authority, or that I’m interested in researching. I’ve always liked admiralty, for example, as well as international law. I’m experienced with immigration, contracts, IP, licensing, transactional work . . . so all that stuff finds its way in. I’m not very experienced with litigation, but that’s the sort of thing people visualize when they think about a legal drama, so I can’t get away from courtroom scenes. I also have a ton of experience (obviously) with running my own small practice, which is something I bring into She-Hulk in every issue. 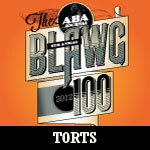 What is the best way to portray legal issues and proceedings to non-lawyers in a visual medium? You would have to ask Javier Pulido, Muntsa Vicente, Clayton Cowles, Ron Wimberly and Rico Renzi, since they’re the artists who have to make my chatty scripts work. I’m constantly amazed and impressed by their ability to make ordinary conversations pop. She-Hulk wouldn’t work without the art team, there’s no doubt about it. 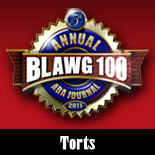 Who is your favorite fictional lawyer, and why? It’s hard to beat She-Hulk for me at the moment, but I’ve always had a soft spot for Lionel Hutz, and Saul Goodman was an amazing character among amazing characters in “Breaking Bad.” I guess I like my fictional lawyers to be on the exaggerated side. What is the first comic book you remember reading, and how did you comic across it? 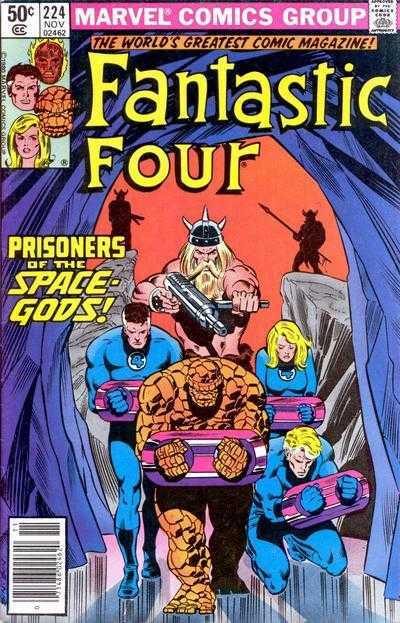 Fantastic Four #224 – “Prisoners of the Space Gods.” They get taken prisoner by a bunch of Asgardians (which will happen). My dad bought it for me in the drugstore one day – he got them for my siblings and me to keep us quiet in the backseat – it totally worked. 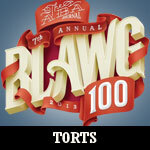 What do you think is the best pop culture depiction of law school? You know, law school doesn’t get a lot of representation, at least that I’m aware of. One L, probably? 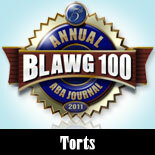 Are there any legal or comic book blogs that you enjoy that you might recommend to our readers? Other than this one? I wouldn’t dare. BIOGRAPHY: Charles Soule, a graduate of Columbia Law School, has been practicing law for over a decade. Prior to starting his own practice (The Law Offices of Charles D. Soule, PLLC in Brooklyn), he worked in the New York offices of Ropes & Gray, LLP. He is a member of the New York State Bar and the American Immigration Lawyers Association. He earned his undergraduate degree from the University of Pennsylvania in Asian and Middle Eastern Studies, with a concentration in Chinese language and history. You can follow him on Twitter here.